Ned also sent this note from bugguide.net (loads of photos of all manner of 'bags'). 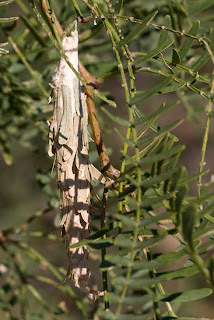 "Larvae (bagworms) construct spindle-shaped bags covered with pieces of twigs, leaves, etc., and remain in them -- enlarging the bags as they grow -- until they pupate (also in the bag). Adult females remain in the bag, emitting pheromones which attract adult males to mate with them. Eggs are laid inside the bag, and when they hatch the larvae crawl away to begin construction of their own individual cases."